The ancient lore of Camelot meets the fantasy of the future in this incredibly amusing tale of the evil sister of King Arthur as she is transported forward in time to the late 21st century. 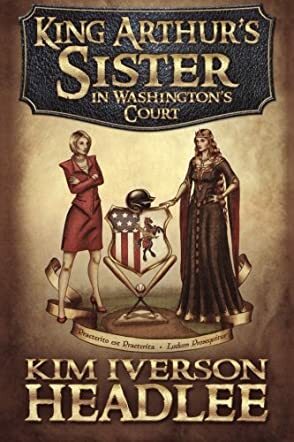 King Arthur's Sister in Washington's Court by Kim Iverson Headlee whisks Queen Morgan away from a dying Arthur to the future, to where she wanted to confront the Connecticut Yankee whom she blames for unacceptable changes to the Kingdom. Loosely based as a follow up to Mark Twain’s famous story, A Connecticut Yankee in King Arthur’s Court, King Arthur’s Sister in Washington’s Court takes the infamous Morgan le Fay to the future where she has an unusual effect on American politics as well as the World Baseball Federation with her purchase of the London Knights. With a bit of magic and a lot of queenly determination, Morgan helps create a new path for the president and makes waves in the world of baseball while making more than a few new enemies. Will time travel get Morgan back to her brother or will some other transfer over the centuries create even more distortions in what history has to report? Full of wit, woman power and clever critiques of the political scene as well as the ‘good old boy’ network of professional sports, King Arthur's Sister in Washington's Court by Kim Iverson Headlee is a pleasant read that crosses all types of preconceived ideas about style, substance, time and place. A love story, a quest for revenge, and a change of heart, plus so much more provide plenty of interest, and Headlee’s quick-paced narrative and dialogue keep you eagerly turning the pages. This is an unusual story that makes you glad you took the chance. A unique story that is a lot of fun with plenty of strategic jabs at conventional practices.